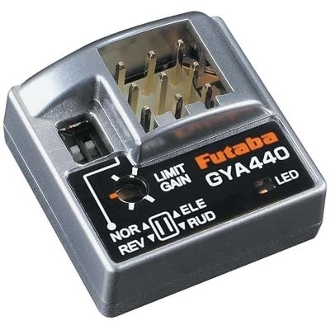 This is the Futaba GYA440 Single Servo Rate Gyro for Airplanes. To install, plug the servo into port 3.
gyro sensitivity can be adjusted using the limit trim. network via the receiver or another S.BUS device. When not using S.BUS, the Elevator/Rudder switch has no effect. switch to the rudder position will set input to channel 4.